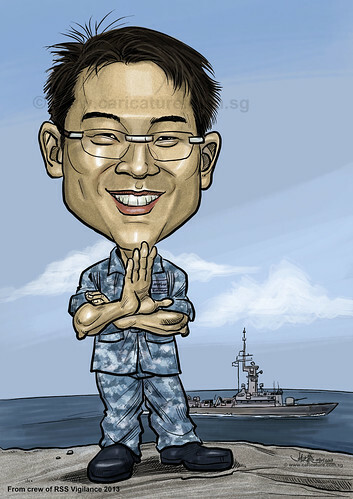 "....My boss is Commander of RSS VIGILANCE (Ship number 90). He is the one in the centre photo of the 1st attached picture wearing red Adidas polo tee. The 2nd attached picture is the ship we wanted the background to be in, but change the ship number to 90, and make it more prominent. Do omit the ship behind it as we wanted only 1 ship in the background. His rank is Lieutenant Colonel (LTC , 2 tiger-lion insignia), and we wanted it inside the caricature. We wanted him to be drawn wearing Smart No. 4 (Sleeves rolled up), but do take note that the pants will go down all the way and not like what the army boots (So its just like wearing normal pants). Its not that revealing. As for his arms we wanted him to fold his arms, but with a palm sticking out gesturing "wait a minute" while still folding them. Palm facing us. At the bottom I'd like to state "From crew of RSS VIGILANCE 2013", font and design up to you, just at a small corner or where you think it will look good. 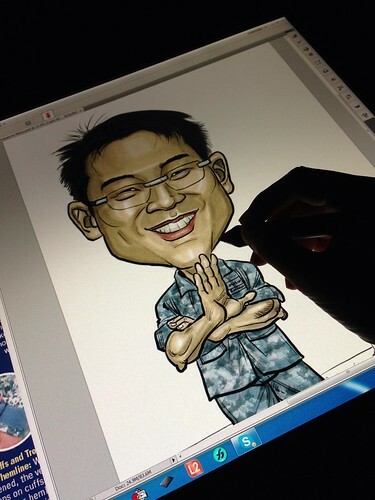 Caricature can be in portrait or landscape mode, whichever you think is best...."